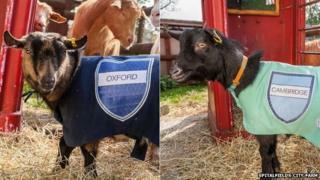 Oxford has edged to victory over Cambridge after the two sides locked horns in east London's annual Goat Race. Two pygmy goats raced 200m at Spitalfields City Farm near the River Thames, where the university Boat Race has taken place. Hamish secured Oxford's first win in six years, defeating newcomer Hugo, who ran for Cambridge. The pair competed for an edible vegetable trophy. The current record for the course - from the farm's paddock to the stables - stands at 56 seconds. Farm manager Mhairi Weir said: "Our goats race every single day, because they're down in the paddock during the day and then they're taken back up to the stables for their food - they're always in a rush. "If the goats choose to race at a leisurely snail's pace, then that's fine by us." Hamish, who also won last year when he represented Cambridge, and Hugo underwent health checks before the race, and are used to crowds thanks to visits from school groups, Ms Weir said. "It's fantastic how it's caught everybody's imagination... I even got an email from ABC, American Broadcasting Company, who wanted to come and video it," she said. Tickets for the race sold out, with all the money raised due to be used to purchase food for the farm. Last year more than £10,000 was raised, covering the food bill for an entire year.